When I was reviewing "Suggested Edits", I came across an edit where someone had pasted the code from the Fiddle OP had added into the original question. I skipped it because I was unsure what to do. What would be the correct way of handling this? Approve, Reject? What the editor did is wrong, because it copied content he did not own into a question which is under CC-BY-SA. 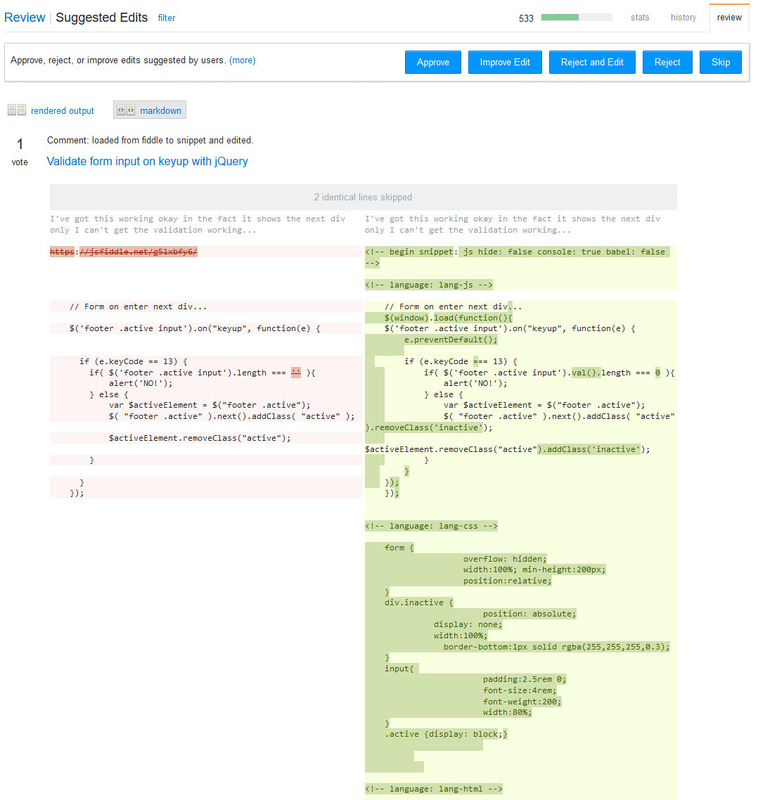 This could theoretically allow other people to legally use code that the OP specifically did not want to allow (jsFiddle does not impose any kind of license, and all the copyright rights remain to the sole author of the snippet). Comment on the question noticing the OP that the post is incomplete and they should add a StackSnippet. Vote to close the question as lacking an MCVE. If the author has a minimal reproducible version of what is his issue, then the outside resource link isn't necessary. If the MCVE included in the question doesn't illustrate the problem yet the one in the outside resource does, including the code from the outside resource is warranted, otherwise close it as lacking MCVE. The later option is obviously more costly for the community so it should be avoided. It can be simply edited into the question, in all the years of SO, I haven't heard of a single case of someone complaining that its code was included in the question so others can answer it... never. How to handle edit limitations when adding code to a question? Suggested Edit Replacing JSFiddle with Stack Snippet, what to do? Can I fiddle around with someones question? Can we please default to the markdown view when reviewing suggested edits? Are edit's that translate the user's post ok?